What’s your highest score on Flappy Bird? The concept was simple: tap your smartphone screen to maneuver a tiny little bird through an obstacle course of openings in pipes. 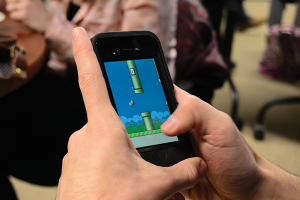 There was something about Flappy Bird, though, that made it one of the most popular games on the market. On top of everything, it was free, and the world was hooked. That is until its developer, Dong Nguyen, had it removed from all of the app stores. Flappy Bird may have first been released last May, but it really rose in popularity in recent months, quickly becoming one of the most downloaded app in the iTunes and Android stores. So, why did its creator take it down? The 29-year-old video game designer took to Twitter to break the bad news to his 169,000 followers. “I am sorry ‘Flappy Bird’ users, 22 hours from now, I will take ‘Flappy Bird’ down. I cannot take this anymore,” he tweeted on Feb. 8. Nguyen’s intentions may have been good, but still, many students are bummed to see the app go. Junior Katherine Englund said she loves to play the game, but does find it addictive. “I wish I could delete it when I have a lot of school work to do and just redownload it, but now that they removed it from the app store, I don’t want to lose it forever,” she said. While Flappy Bird once held the No. 1 spot on the free apps chart, it has since been replaced by rip-offs, like Splashy Fish, Ironpants and City Bird, which now hold the top three spots respectively. However, there will only ever be one Flappy Bird.